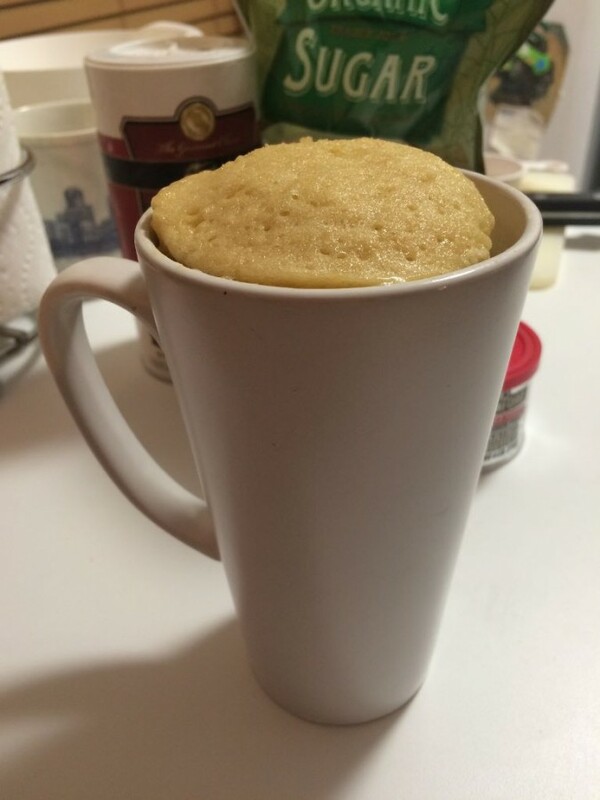 A double serving of the Classic Yellow Mug cake. If you ever find yourself craving a sweet treat at an inconvenient time of the day, fear not! Mug cakes are the food trend that will satisfy your sweet tooth within minutes. They’re pretty much perfect for every occasion, whether it be a quick sugar fix during a study session, or a fun and tasty craft while hanging out with friends. Also, if sharing isn’t your thing, these cakes are perfect for you since they don’t require large amounts of ingredients, making them an ideal personal portion size. These mini desserts can indulge your cravings in little time since the ingredients are probably already in your kitchen. Before baking, it is important to choose a mug that is microwaveable and that it is sprayed with oil or butter to avoid sticking. Also, try not to fill up the mug more than halfway with batter (the recipes ask for it to be divided into two mugs). The recipe below is from Mug Cakes by Leslie Bilderback. Place butter into the mug and microwave until it has melted. Add egg and whisk with a fork. Add the rest of the ingredients and stir until batter is smooth. Divide batter into two mugs and microwave them separately for about 2-3 minutes until the cake is firm. Add frosting or toppings if desired. This mug cake is the easiest and quickest to make, however there are hundreds of different mug cake recipes in books and online, ranging from traditional flavors like red velvet, to funky concoctions like pumpkin spice. There are also mug cake recipes that are vegan and gluten-free for all to enjoy!